Our Deluxe Rooms are our most spacious and comfortable rooms. A large window in both sleeping room and bathroom enrich the brightness of the all ambient. A large Kind Size Bed composed by a unique mattress is the best way to relax in Cortona; the room is facing over our Ghibellina Street, which is very quite during day and night. Our Deluxe Room are recommended for adult couples and to celebrate some special occasion like an Anniversary. Equipment in the rooms: Tea and Coffee Set, free of charge, to enhance the stay of our Guest. Heating during winter and A/C during Summer. TV with Italian and BBC / CNN for international news. Hair-drier and our relished Room Amenities. 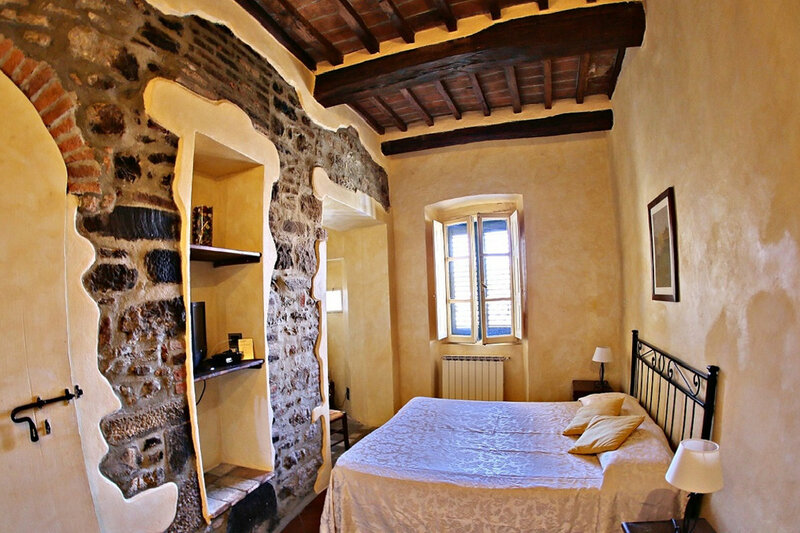 In-room Wi-Fi signal might be limited by the thick Medieval walls which are the famouse historical part of Cortona city center ancient buildings. Our Single Rooms are a good solution for business or leisure lonely travelers. Equipped with a single bed and with the same comfort of the Standard Rooms, they are situated among the various floor of our building. The Standard Room are our entry level category. They are simple and comfortable. Located at the first floor of our palace, they are facing the neighbours building’s. During summer this rooms remaining a bit fresher than the other rooms at higher floors. The Superior Rooms are more comfortable and brighter than the Standard Room, as they are more spacious in terms of room size. Superior Room are the best solutions when an extra bed or a baby cradle is needed. As we are in a traditional old building, fornitures are matching this theme, and some room has Medieval Walls inside the room itself. 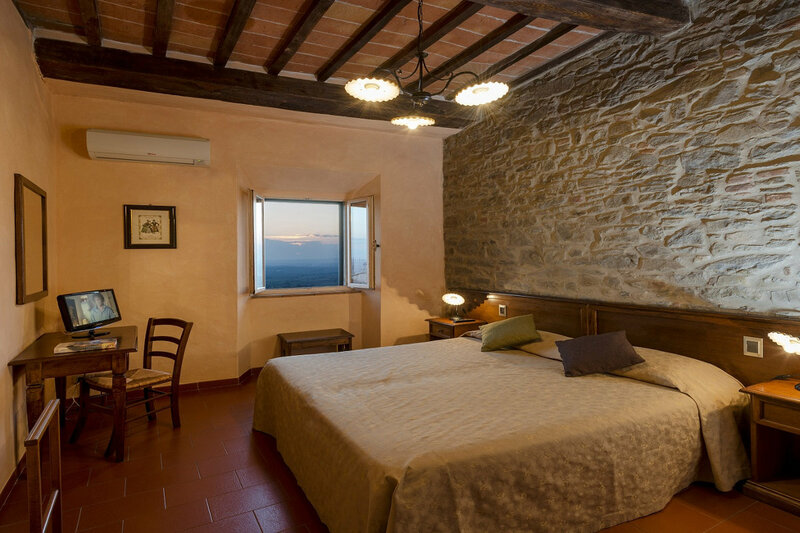 The Superior Room with View, with the same positive caractheristics of the Superior room enrich the stay in Cortona with a romantic view on the Valley Valdichian and trought typical village roofs and chapels. Recommended for couples. 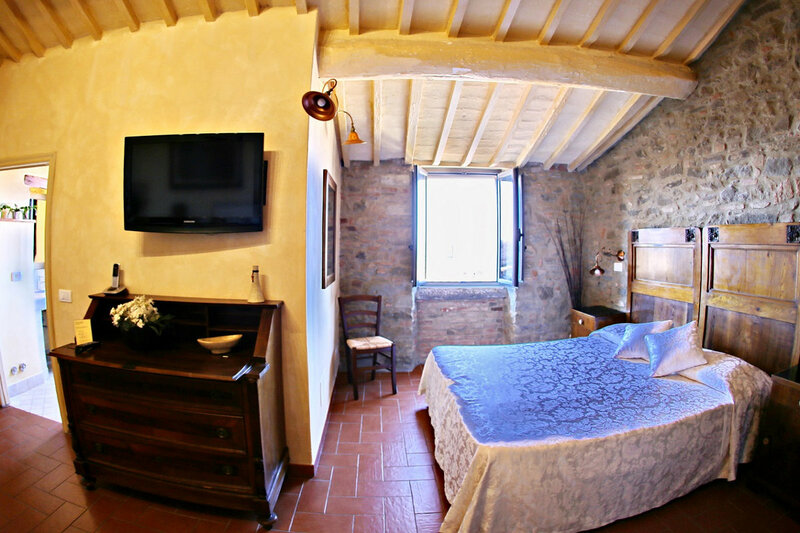 Superior Rooms with View are located at the third floor; fornitures and interior design are typical from ancient medieval palaces since 14th Century. 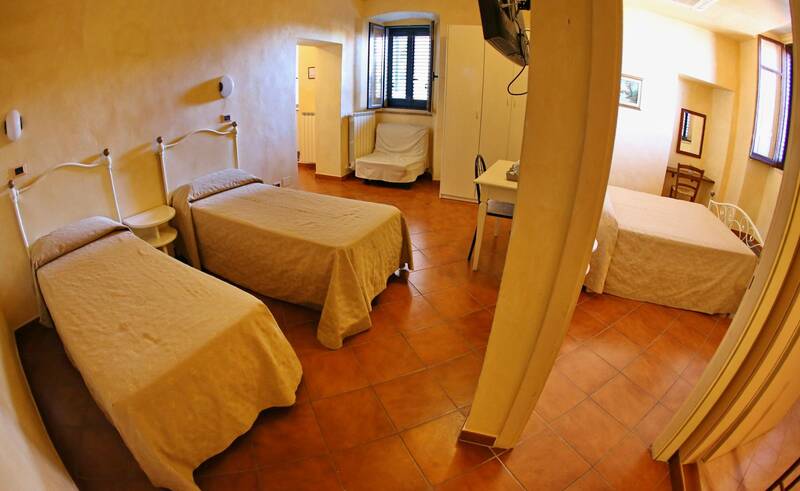 The Superior Triple Room it’s the perfect choice for families and it’s very well dedicated to a small group of friend. 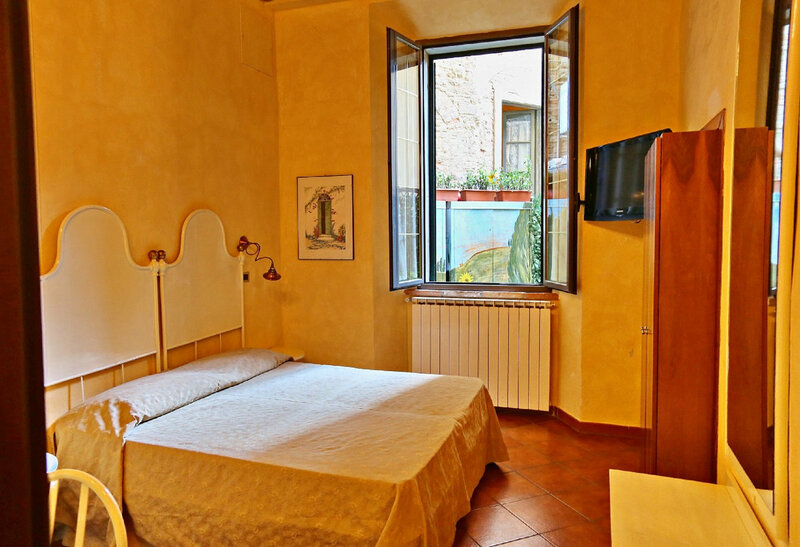 The room is equipped with a large double bed that can be arranged in twin bed and with a third bed already into the room. Our Family Room it’s very well dedicated for a large family or for a group of friends as well. It’s composed by a double room and a large room with twin beds. 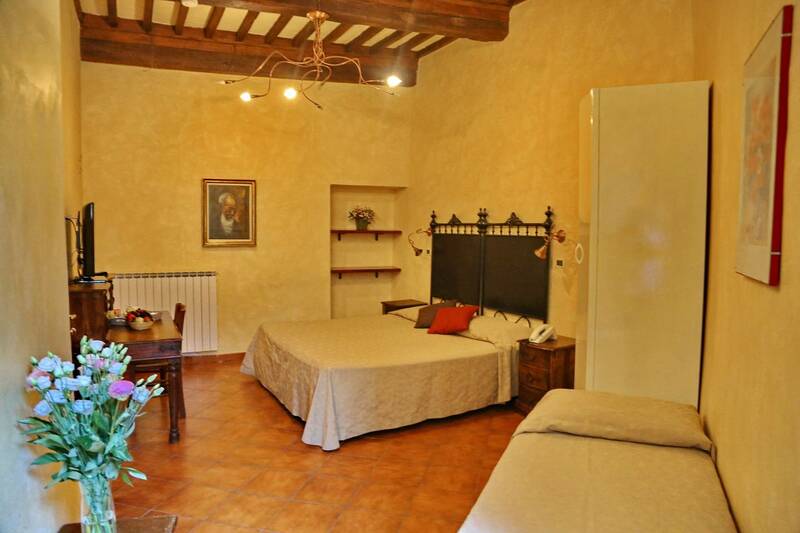 Very bright and spacious with the possibility to organize a third bed or a baby crib. A bathroom is in common for the both rooms.